In the national holidays of Reunification Day and May Day, city inhabitants from all corners flocked to amusement parks, commercial centers and supermarkets to buy commodities and avoid scorching heat, causing traffic jam somewhere. 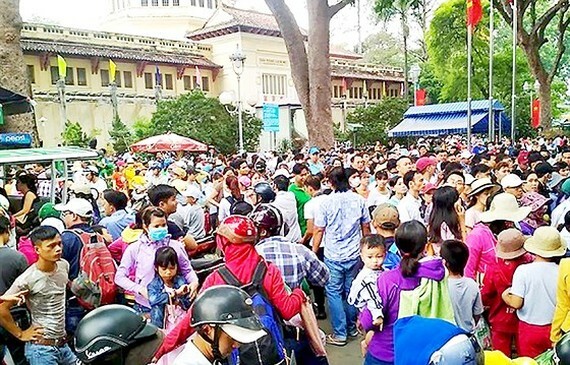 Thousands people gathered in Co.opMart Nguyen Anh Thu in district 12, Aeon Mall in district Binh Tan, Emart in district Go Vap. Consumers said that they prefered nearby places instead faraway provinces during the holidays. “I just wanted to buy some food, but I had to queue in a long line sweating a lot, said Le Ngoc who bought items at Aeon Mail. Despite heavy rain in the afternoon, flock of people rushed supermarkets and commercial centers where launched many promotion programs to encourage people to purchase in the holiday. Also, commercial centers sent more employees to ensure security and safety for customers. Anyone who buys VND500,000 up will be given a voucher of VND30,000. Wholesale markets such as Hoc Mon, Binh Dien, Thu Duc were flooded with commodities at fixed prices and prices of seafood were lower than normal because it was a monthly vegetarian day on the 15th of every lunar month. 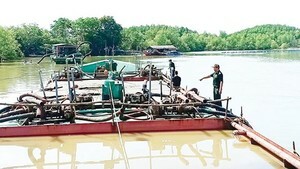 In addition, city inhabitants chose to rest in rural outlying districts in the holidays such as Van Thanh, Binh Quoi tourist parks or river tourist park Binh My in suburban district Cu Chi. In the parks, people participated in folk games and set up tent to rest the whole day. Dam Sen Park in district 11, Suoi Tien Amusement Park in District 9 and the zoo were the choices of not only city dwellers but also people from other provinces dủing the holidays.